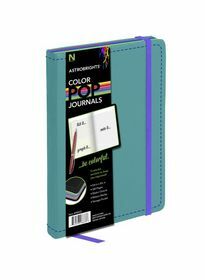 ALPHARETTA, GA--(Marketwired - Jul 13, 2016) - ASTROBRIGHTS® Papers, the market leader in high-quality, brightly-colored paper, has launched a new line of journals that will Colorize™ the category of everyday work essentials. The Color Pop® Twin Wire, Color Pop® Flex and Color Pop® Leatherette Journals use Astrobrights' colorful paper as the anchor with details in bright, contrasting colors. Color Pop® is the first full line of color paper journals on the market, giving consumers bold new options to infuse personal style into functional products for the everyday. 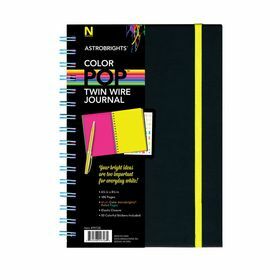 The Color Pop® Twin Wire Journals feature a durable, black hard board cover with a luxurious, soft-touch finish, accented with Astrobrights' signature colors on the interior pages. Consumers can choose from three color selections that offer 180 interior pages of Astrobrights® Premium color paper with color rules. A binding wire and corresponding elastic closure come in contrasting hues on the outside of the journal, allowing the colors to pop against the black cover. Color selections include Martian Green™ interior pages with Fireball Fuchsia™ accents on the exterior, Cosmic Orange™ interior pages with Lunar Blue™ exterior or multi-color form, which features five different Astrobrights colors. Each product is supplemented with 50 colorful reminder stickers that can be placed at key points throughout the journal or used elsewhere as memos for important tasks. Sized at 6.5 by 8.5, the journals are perfect for tucking into backpacks, briefcases or purses, keeping them at the ready for life's important moments. "We believe bright ideas are too important for everyday white paper," said Jeremy Frank, senior consumer brand manager for Neenah Paper. "Journals made with Astrobrights' vibrant colors give customers a functional and colorful way to blend their personal style with a tool they use every day." Color Pop® Leatherette Journals are the third new Astrobrights product to join the category, featuring enhancements that increase functionality beyond the everyday journal. White interior pages are highlighted by external edging in five colors that create easy-to-navigate sections. Soft Italian leatherette covers are available in black, green, teal or purple with contrasting topstitching, ribbon markers and elastic closures that create pops of color in unique color combinations. The interior's 240 pages provide next level functionality offering three-formats per page including graph/grid, list and line-ruled layouts. An expandable storage pocket built into the back cover provides another solution for consolidating projects in one product. Neenah (NYSE: NP) is a leader in premium image and performance-based products, including filtration, specialized substrates used for tapes, labels and other products, and high-end printing papers. Products are marketed under well-known brands such as CLASSIC®, ASTROBRIGHTS®, ENVIRONMENT®, CRANE®, ROYAL SUNDANCE®, SOUTHWORTH®, KIMDURA®, Gessner®, CRANEMAT™, CRANEGLAS™, JET-PRO®, SofStretch™ and Varitess®. Neenah is headquartered in Alpharetta, Georgia, and its products are sold in over 70 countries worldwide from manufacturing operations in the United States and Germany. Additional information can be found at the company's website, www.neenah.com.